If your Greek dining tastes run to the less traditional, you will one day find yourself facing a plate of cooked Cretan snails, a famous specialty on the island of Crete. Here’s what to do. Stare at the plate of snails and wonder what to do. Observe your companions, now on their fifth or sixth snail. Select a likely-looking snail. Big ones are easier to grip. Clutch it firmly. With your fork, drive a tine into the apex of the shell’s spiral, creating a small hole. 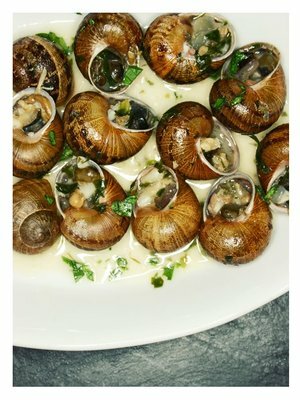 Place the larger opening of the snail shell against your mouth. Using your forefinger, cover and uncover the hole you made in the shell while sucking at the larger opening. Continue until the snail suddenly pops into your mouth. Congratulations! You’ve eaten your snail. If this dramatic method doesn’t work, try working the tine of the fork into the snail in a spiral motion until it pops out the other side. Then eat it. Repeat until full. Alternate with sips of raki. You may find a more generous raki-to-snail ratio helps. Larger snails are a little easier to work with. 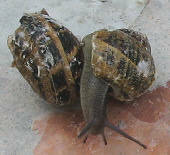 Let the snail drain of cooking water before you bring it toward you. This is a traditional dish often served with raki, and the raki really helps move this process along. A traditional rakadiko, or raki house, is helpful but not required.